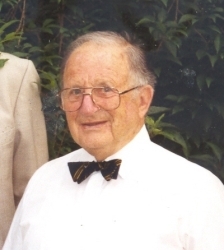 The death has just been announced of Mr Harold J. Lush, BA ( a former scholar from Trinity College, Cambridge ) who was a Master at the Cathedral School for a considerable number of years. He retired at the end of the 1980's but continued to serve the school as an Invigilator during GCSE examinations. As Major Lush, Harold was Officer Commanding for the Army Division of the school CCF for over 25 years, having formerly seen active service as an Officer in the Royal Artillery in India and Burma. He was mentioned in dispatches after using his ingenuity in overcoming major transportation obstacles at that time. A further tribute was printed on page 33 of the Old Herefordians' Newsletter 2008 edition.